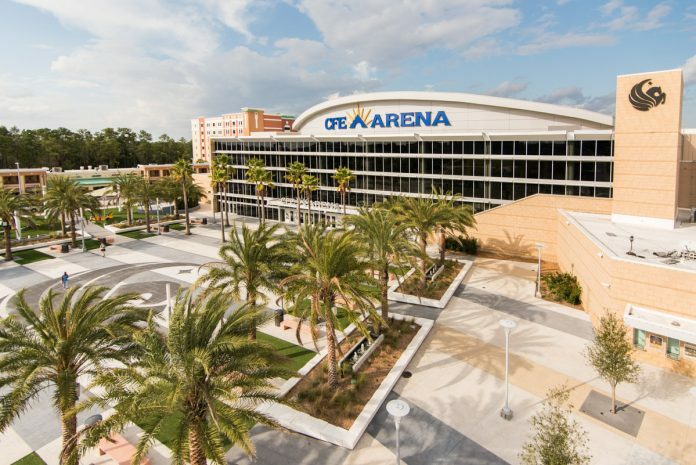 One of the University of Central Florida’s campus landmarks will “undergo a makeover” in Spring 2019 and change its name to Addition Financial Arena. Formerly known as the UCF Arena and built in 2007, CFE Federal Credit Union earned the naming rights to the arena in 2013 and has hosted events from concerts, MMA fights, presidential watch parties and rallies, and numerous athletic events. The arena sold out in 2017 and posted its highest attendance when the UCF men’s basketball team hosted Illinois in the NIT Invitational. CFE Federal Credit Union mailed a voting form to its members announcing a plan to change from a federal credit union to a state credit union, citing an opportunity to tailor the banking system to Florida residents and expand outside of Central Florida. As part of the change in structure, CFE will change its name to Addition Financial. “We are pleased to continue our partnership with the University of Central Florida and the CFE Arena as we transition our name to Addition Financial. Under our new name, we will remain dedicated to our heritage in education, and will proudly serve the university in the years to come,” says Kevin Miller, CFE’s president and CEO. The name change for both the bank and arena will take effect on May 1. CFE will pay for the installation of signage which will begin in late March. CFE/Addition Financial will continue to be UCF’s official financial institution. “We have a fantastic relationship with our great partners at CFE. We are proud to now serve as a landmark as they rebrand the credit union to Addition Financial and continue to host quality events for the Central Florida community. Our partnership with CFE Federal Credit Union helps provide important and convenient resources for our students, faculty, and staff,” says Ronnie Lamkin, general manager of the UCF Convocation Corporation, which operates the CFE Arena. Photo courtesy of UCF Communications.